It's like this: I created man and woman with original sin. Then I destroyed most of them for sinning. Then I impregnated a woman with myself as her child, so that I could be born. Later, I will kill myself as a sacrifice to myself to save all of you from the sin I gave you in the first place. 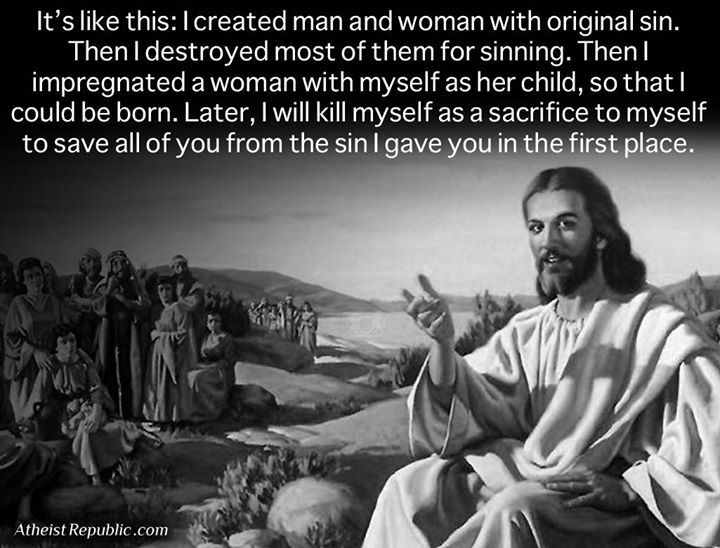 LOL, Jesus never said that but the Christians sure to think did. Pretty much sums up what they believe though that and all the other stuff like God is good, God is great, God is Just, God is fair, God is merciful, God is peaceful and God is forgiving, but you better believe in him or your going to special place he made for you called hell. Obviously these people neglect to read thoroughly and understand their own holy text. If they took the time to do Read their own books they would understand their God advises women be treated as property for man to do with as he pleases, their god tell his people the Israelite people to carry out genocidal practices, the bible condones slavery and it has well laid out instructions about how to and when to hit your wives if they think themselves better than you. and he was just an all around homicidal jealous childish prick who plays games with peoples lives and wants nothing but your never ending love and praise ect. ect. but then again, maybe most Christians have read all this and realize that if their god is real they better not point all this out or else he may send them to hell for speaking of him in a less than flattering way.